You don’t have to buy a rotisserie chicken every time you feel the urge to have some at home. If you think you’ll be a frequent diner on roast chicken, turkey, lamb, pork or vegetables, why not invest in an electric one that’s made for home cooks? Not only can it save you money in the long run, but it is easy to use and you can try various seasonings and rubs each time for more variety. And although you can make roast foods in a standard oven, only a rotisserie can provide the ultimate flavor, as the foods on the spit slowly rotate over a steady source of heat so as to cook evenly throughout for a moist interior and a crispy exterior. This method helps excess fat drip down and the rotisserie doesn’t heat up the kitchen like a conventional oven does. A rotisserie oven for home use also allows you to enjoy your roast dishes all year round so you won’t have to rely on perfect weather to fire up an outdoor grill. 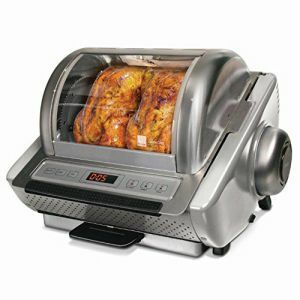 When looking for the best rotisserie machine for home use, there are a few things you should keep in mind. You can find these ovens in various shapes and sizes, so you will first have to figure out how often you’ll use it and how much space you have for it. Most indoor electric rotisserie grill options are for use on a countertop. If you’re only cooking for 2-3 people at a time, you may be able to make do with a mini oven but if you’d like to cook for up to a week, get one to accommodate a larger bird. While horizontal rotisseries are more common, a vertical one will take up less space and usually release more fat that drips down into a drip tray, so this may be a better option if you’re into healthy cooking. A few of these models don’t offer rotating spits if the heat emanates from all over the inside of the oven. The following countertop rotisserie oven reviews should give you some good buying options, but if you’d like to see some more models, take a look at what’s available on Amazon now. You might also like to consider a turkey roaster oven, which is another indoor electrical device that looks like a slow cooker but is actually a roasting oven that turns out extra tender meat, which is quite a good thing when it comes to cooking turkey. If you’re looking for an extra crispy skin but have to cook the turkey indoors, consider an electric turkey fryer. Ronco practically invented the countertop rotisserie oven, and the Ronco Showtime Platinum Edition is one of the best of the breeds. Ronco encases the rotating spit in what might be called a countertop oven, which makes this rotisserie easy and compact to use. The Platinum Edition Rotisserie is an energy saver, since it uses about one third the electricity of your oven, if you were doing it in there. The 11-inch depth, 14-inch width and 13-inch height means that you can get close to a 14 pound turkey inside. Unless you have a very large family or expecting a crowd, that’s big enough for any Thanksgiving. Better still, you’ll be able to fit in a couple of chickens side by side on the spit, plus there are accessories for fish, veggies and virtually any other food item you want to cook inside. As they say, with the Ronco you just “set and forget,” and that’s why this appliance is so easy to use. There is no temperature control except for 3 preset options – normal rotation, rotation without heat, and pause and sear. Then you dial in the timer per pound of food you have, turn it on and walk away. And if you are worried about the end result, forget it. Ronco rotisseries are routinely rated at the top for food quality and taste. As food friendly as they are, they are equally user and clean-up friendly too. An “On” and “Off” switch, temperature preset and a timer are the only controls to worry about. And when it comes time to clean, the inside just needs to be wiped clean with a damp cloth, and both the removable door and the drip pan are dishwasher safe. For the price and the product you get, there is none better. If you’re looking for a compact package for easy storage, that’s exactly what you’ll get with the Ronco EZ Store Rotisserie Oven. This horizontal rotisserie design, although a standard size, easily folds down into a compact nested design when not in use, and it comes with very useful accessories like a spit, multipurpose food basket for grilling flat foods, a carving platform, removable drip tray, gloves and food ties. An 8 to 10 pound bird is going to be about the maximum size you’ll fit inside, but for most families, that will be plenty. You’ll save energy over cooking in the stove with this unit, and it will take up much less counter space than the larger horizontal style rotisseries. In fact, this one breaks down so effectively that you’ll be able to store it inside of a drawer! Once again, quality of roasting will never be in question with a Ronco rotisserie. The compact unit features digital controls for the “set and forget” feature, but it is still just as easy and just as efficient. It is damp wipe clean, and the accessories will go in the dishwasher. If you like the idea of a vertical rotisserie, you need to check out the NutriChef PKRT16BK Rotating Oven. The unique design rotates vertically, which makes it a compact unit that may fit in a corner where others won’t. Food quality is terrific, but then that’s why you get a rotisserie for in the first place, and this one will tickle your taste buds. It is a little down in power, and all that really means is that, it will take your food a bit longer to cook. The even heat comes from two heating elements. As do all rotisseries, excess fats drip off, and possibly, a vertical rotisserie may drain a bit more fat than a horizontal type. You’ll be able to get about an 8 pound bird inside, which is good for a family meal, and the NutriChef comes with a bevy of accessories, like a poultry rack, fish basket, kabob tower and drip tray. You will be able to roast just about any food that you want, and you’ll be using less energy than if you were using your oven. This is also a “set and forget” type unit with a 2 hour maximum timer dial. The accessories and drip pan are all dishwasher safe, and this is also a “set and forget” type unit that is easy to use and will give a good account of itself in your kitchen. This is the smallest and least expensive unit on this list, but if you are cooking for a small family, the CuiZen Vertical Rotisserie would be a solid choice. It won’t hold much more than a 6 pound bird, so you’ll have to plan dinner around that. This also has temperature settings along with time settings and is a bit more complex to use, but nothing really too complicated, and the push buttons for the settings are pretty self explanatory. This is another slightly under powered unit, which means you’ll need to turn up the temperature to ensure fast roasting. It comes with 8 kabob skewers and a fish/veggie basket in addition to the poultry rack and drip tray, to make it a versatile and very effective machine.